Part 1 covered standard graphite pencils for inclusion in a lightweight art kit for hiking. It is, of course, possible to take coloured pencils on the trail. I have a fondness for both the Derwent Graphitint and Derwent Drawing pencils, but with the sole purpose of cutting down on weight and bulk and simplifying as far as possible when constructing a travel art kit, I decided that I would take a small pallet of watercolours instead. These are the subject of a separate post. If taking coloured pencils, it is simpler to take those pencils that experience has shown to be the most used and that suit you. There are any number of types of coloured pencil available from a wide range of manufacturers. I haven’t tried them all by any stretch of the imagination. I doubt anyone has. But, if you like them, then select what is most suited to the subject matter and take them along but it is very easy to take far too many ‘just in case’. If kept loose, wrap an elastic band around them to keep them in sets. But be aware that some coloured pencils, the Prismacolour in particular, are delicate creatures and don’t take kindly to rough handling. The Derwent Inktense pencils may suit some artists, their intense (geddit!) colour is water soluble so could be combined with a simple waterbrush. However I have little personal experience with these. Be warned, the colour produced when wetted, is considerably brighter and more vibrant than when applied dry. One particular problem I have with a lightweight kit is the compromise I have to make with my sketchbook. The lighter weight paper I am choosing to take will not easily handle the wetting of watercolour or Inktense pencils without cockling. Responsible for some of the finest journals I have seen, Kolby Kirk decided to stick with his favoured Prismacolor watercolour pencils and created a homemade palette with them. It really is quite ingenious and suits his style of journaling admirably. Certainly Kolby continues to produce quite exquisite results with his various set-ups. However I thought there was perhaps a little too much bulk to his system. To each his own. Derwent produce their coloured Drawing pencils in a lovely range of twenty four natural and earth colours that lend themselves quite well to nature and landscape studies. They work well on coloured, even black, paper. Derwent themselves call these their ‘fur and feather’ pencil. Being quite soft, they blend well. 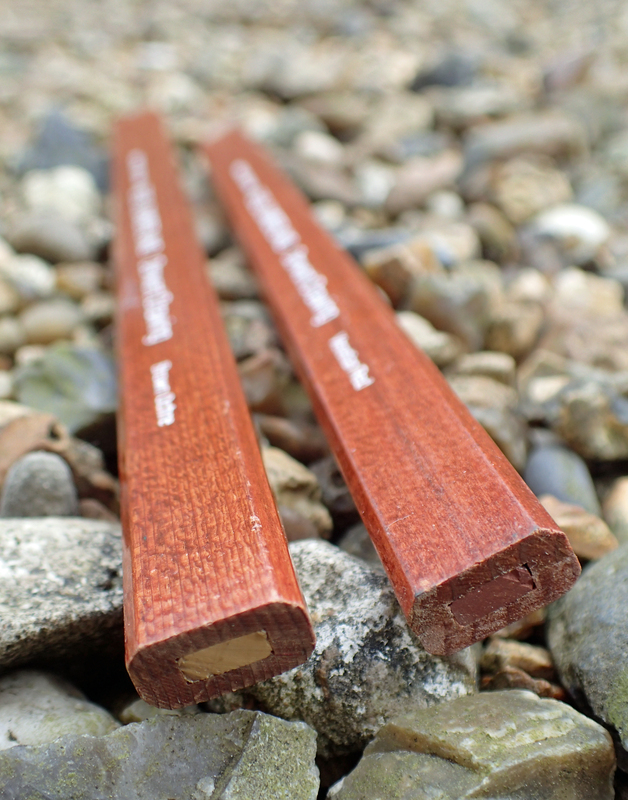 While they are normally available as a 10g round pencil with a wide coloured core, there are also some uncommon, hard to find, but useful flat, octagonal wood barrel, 13g variants with a useful wide flat rectangular core. Obviously these can be sharpened with a knife or there are carpenters pencil sharpeners available that can do the job. A knife is more practical on the trail. Derwent also produce a narrower core version of their coloured pencils with a particularly soft nature. Again, I have very little experience of this range of 72 Coloursoft pencils. I will discuss my preference of white gel pen elsewhere, where I look at the pens I (occasionally) take hiking. As to white pencils, the bright white Derwent Chinese White Pastel 7200 pencil shown above included in the Derwent Sketching kit has long been a favourite of mine, though I do admit to finding it a little crumbly and it wears quickly. While it can be purchased as a single product, the longer lasting Caran D’Ache Luminance 6901 below is the better option. Certainly it is better than the water soluble White offering in the Graphitint range also shown below. As discussed above, I tend not to take coloured pencils with me often. 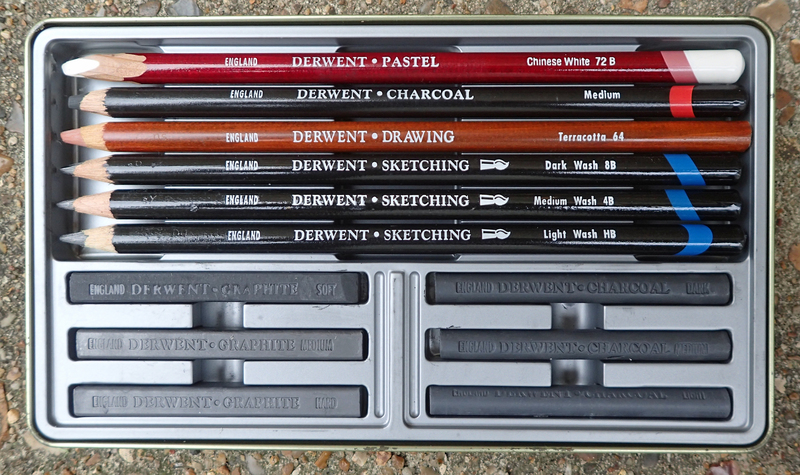 A good cross-over product that I have only been using for a few months, is the 24 colour range of Derwent Graphitint pencils. I do like the softer tones of these tinted graphite pencils. The range is particularly suited to natural subjects and landscapes especially. Another bonus to these pencils is that they are water soluble. A single water brush works well with the colours, an additional vibrancy of colour occurs when diluted. Just try not to use the lightweight, probably no more than 80gsm, paper I have used to illustrate the colour range here. Cockling occurs easily with subsequent puddling of colour. I didn’t include the 24th colour- white. A small selection of these would be a handy addition to a small art kit, but not a truly lightweight set-up. 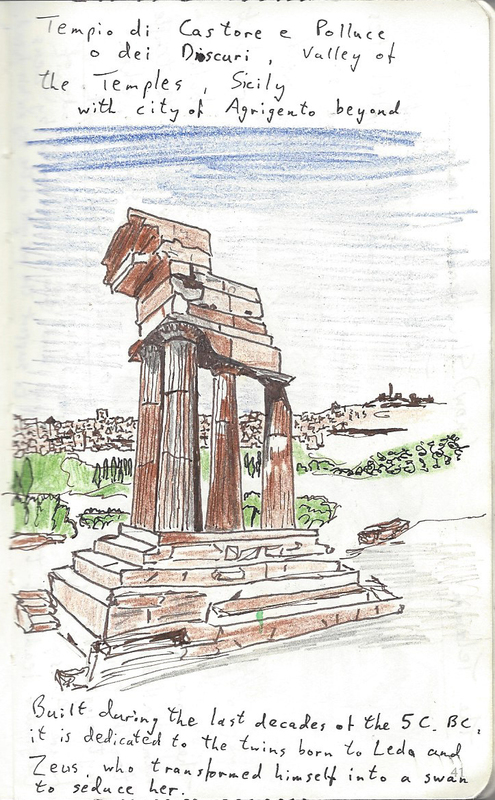 Kept in a pencil roll or case, these are great on a sketching holiday when mostly utilising transport to get around. I used to use a non-photo blue pencil more than I do now. It is now unlikely that one would find its way into any lightweight art kit that I carry. These pencils, much used by cartoonists, are useful for setting down a light planning sketch. Barely visible on the paper, the blue lines do not reproduce when scanned or photocopied. 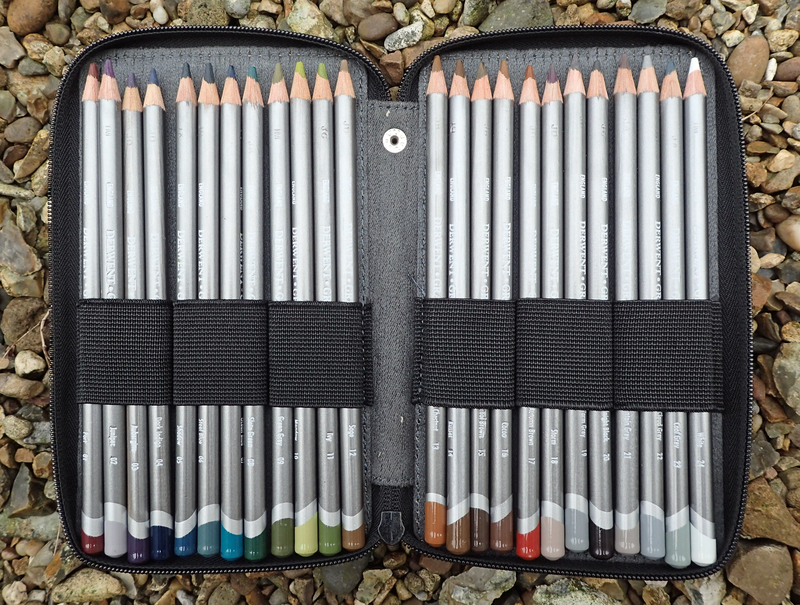 Pastel pencils are also an option for a travelling art kit. The wide ranges produced by both Derwent (8.1g) and Faber Castell (7.1g) are excellent products but can smear easily. Those from Faber Castell are the more robust. My preference amongst these are the lovely tones from the 60 wide Pitt Pastel range. These are a fairly soft pencil, if these are found too soft then Cretacolor pastels are probably the hardest, but more difficult to blend. 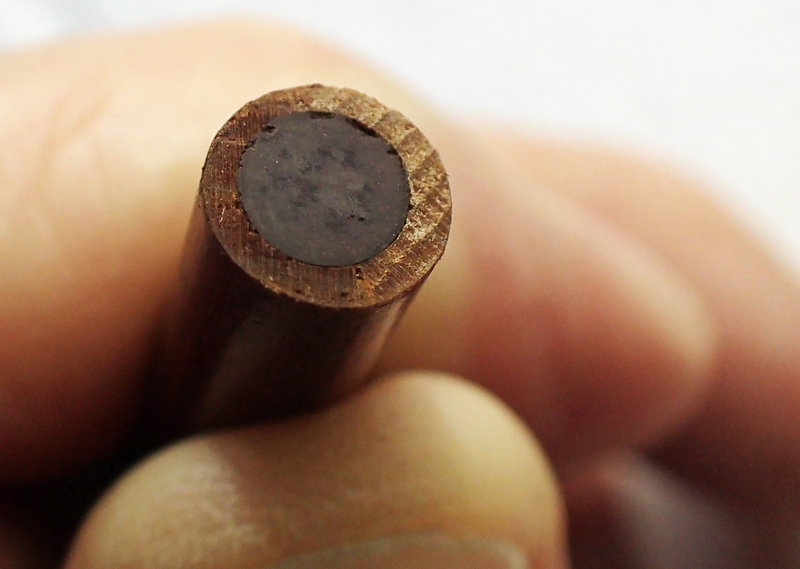 It is best to use a knife or razor blade for sharpening these rather than a sharpener. Pastel crayons could be taken but need careful protection in transit. The wooden casing of the pencils provides this protection. I should add that while I enjoy using this medium I do not have great experience of either pastel pencils or pastel sticks. Many may disagree with me but I am pretty much convinced this is a medium foremost for ‘serious’ artwork rather than as a part of a lightweight art kit to accompany a hiker on the trail. Finally, I do like to use clutch pencils on occasion. These are most often for 2mm graphite ‘leads’. The range of 2mm colour leads for clutch pencils is extremely limited but the small set from Koh-I-Noor can be used to supplement standard graphite leads to add a bit of colour to a sketch on lightweight paper without the risk of cockling that using watercolours or water soluble pencils might cause.